Ireland’s second city an unofficial cultural capital derives its name from the marshy banks of the River Lee; the Irish name Corcaigh means marsh although this bears little relation to the vibrant, confident and lively European city that Cork is today. The center of Cork occupies an island between the two arms of the river. Its narrow alleys, waterways and Georgian architecture give Cork a thoroughly continental feel, a city of old world charm and yet a thoroughly modern outlook. In the 18th Century, many of today’s streets were waterways lined with warehouses; today they house restaurants, chic bars, and bookshops. 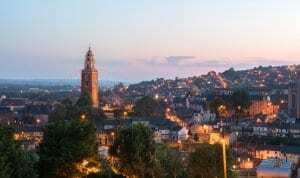 Cork may sometimes fall under the shadow of its bigger brother Dublin, but more than holds its own in visitor attractions and more importantly, the warmth and openness of its people. According to local legend, the city began life as in abbey built by St Finnbarre in the 7th Century. For centuries the abbey flourished as a place of learning and pilgrims would travel from all over Ireland to pay their respects. Sadly, its prominence caught the attention of the Vikings, who ransacked the abbey and the surrounding settlements in 820 AD. They then claimed the area as their own and built a small settlement on an island in the river Lee, the site that houses Cork as we know it today. Under Viking rule, the settlement prospered and Cork enjoyed a relatively stable and peaceful existence until the 12th Century when the Normans began their conquest of Ireland. After the Norman Conquest, the city was surrendered to the Norman King in 1172 AD. Cork flourished under Norman rule and subsequently became the second town of Ireland after Dublin. A busy port trade in cloth ensured the city’s wealth and renown grew in Europe. However, the arrival of the Black Death in 1349 AD wiped out over half of the town’s population. Thankfully, the plague left the city as suddenly and mysteriously as it arrived otherwise Cork may have disappeared from the history books forever. The city gained a certain infamy in the 15th Century, when Perkin Warbeck, a challenger to the English throne, arrived in Cork to rally supporters. In 1492, Warbeck, the mayor of Cork and other citizens of Cork tried to overthrow Henry VII with little success. The rebellion was short-lived – Warbeck and all his followers were captured and executed. After this episode, the city was known as ‘rebel Cork’, a nickname that would endure for many years. By the mid-17th Century the city was prospering from trade with Europe and its population grew to 5000, by the standards for those times quite a large town! Nonetheless it would experience its fair share of turmoil and conflict – Cork was captured by the English Republican leader, Oliver Cromwell, during his conquest of Ireland, in 1649. Then, in 1690 William III, after conquering England set his sights on Ireland and lay siege to the town for 5 days. It was finally captured by William’s general, John Churchill, who promptly took control and destroyed the town walls. Cork then enjoyed a period of stability in the 18th Century, interestingly the town became a haven for French Protestants (Huguenots) who were fleeing religious persecution from French Catholics. An architectural Renaissance enveloped the city, as many famous buildings and monuments were erected in the 18th Century including St Anne’s Shandon. The 19th Century would witness social change, growth and upheaval, as Cork’s population ballooned to about 80,000. Rural poverty forced people towards the city and overcrowding became a major problem. The potato famine that blighted Ireland in the 19th Century ensured that Cork received its fair share of visitors, as it became the main port for emigrants fleeing to the USA and other destinations in search of a better life. However, the city would also enjoy some growth and prosperity, many industries came into life including brewing, shipbuilding and textiles. In 1849 the University College of Cork opened and the first public library in Cork opened in 1892. The 20th Century would see yet more turmoil, as Cork took a central role in events of national and international significance. Cork began this century on a high-note however, with the Cork International Exhibition in 1902-1903. Sadly this sense of confidence would be shattered by the onset of World War I. Cork got a taste of the horrors of the conflict when The Lusitania passenger ship was sunk off the Irish coast in 1915. This atrocity spurned more young men from Cork to become involved in the war effort and many would never return home. During the Irish War of Independence and the Irish Civil War, Cork played a pivotal role in several historical events. The city was one of the major centres of the conflict and many of the most famous figures involved in the conflict were born in Cork, including Michael Collins! It was one of the main centres of resistance to British control and suffered more than its share of atrocities. In December 1920, British troops set fire to several blocks of buildings, burning several key monuments including the Carnegie Library. It subsequently briefly came under control of the Irish Republican Army, who opposed the signing of a treaty with the British to give Ireland increased powers but not complete autonomy. However, they were swiftly ejected by the Irish Free State Army. A period of stability followed the Irish declaration of an Independent State, and the local government of Cork began addressing the many problems in the city. Chiefly, cleaning out some of the city’s worst slum areas and breathing life back into Cork’s more deprived neighborhoods. Cork escaped relatively unscathed from the horrors of the Second World War, although many Irish troops lost their lives in Europe. Cork then stagnated economically for several decades until the late 1980s – the era of the so-called ‘Celtic Tiger’. The transformation of Cork from its fairly run-down condition was remarkable: new hi-tech industries were set up in the city, Cork’s infrastructure was modernized, and scores of restaurants, cafes and shopping centers seemed to spring up overnight. Unemployment plummeted and those who had left Ireland in search of a better life found themselves returning home in droves. Today, this rapid growth continues apace and Cork flourishes as an open, vibrant and welcoming city. On the streets of Cork, the visitor is just as likely to hear French or German as Irish; fitting really as the city has always been at the heart of Europe. Let us not forget that Scandinavian warriors founded Cork city, Normans conquered the city and the English developed the city. Cork was chosen to be the European City of Culture in 2005 and we can hardly imagine a more deserving candidate. Cork changes but its people retain the same spirit of hospitality and warmth – Welcome to Ireland! Ireland has a lively and diverse food scene, and Cork is no exception. Thanks to Ireland’s high-quality fish and other fresh produce, Irish cooking now ranks among the best in Europe. The last 20 years have seen the emergence of a new Irish cuisine based on traditional ingredients handled in new ways. This cuisine utilizes the county’s staples of fresh vegetables, farmhouse cheeses, fish, shellfish (the list goes on) and gives them a fresh lease of life. Ireland is most definitely a foodie’s paradise. Although wines from all over the world are available in Cork, the traditional drink of choice is stout, most famously Murphy’s brand of stout. Irish Whiskey is also extremely popular, Jameson is made in Midleton in Cork County. In Cork city, you will find gourmet hotspots like Café Paradiso with its lauded vegetarian cuisine and Les Gourmandises with its fine French cooking using top Irish products. Noted for its chic bars and eateries, Cork’s Paul Street should be the first port of call for visitors. 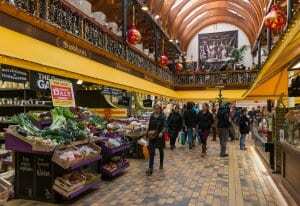 Food heaven, this market in downtown Cork city is the oldest covered market in Ireland and is a national treasure. Apart from all manner of Asian and Continental sauces, potions and ingredients, find the best Irish farmhouse cheeses here (including Buffalo Mozzarella being made in West Cork!). Pick up homemade soaps, wines, organic fruit and veg, the traditional Spiced Beef (a local delicacy most popular at Christmas but also year-round), and much more. You can eat right in the market at the Farmhouse Café, stellar local fare. The jewel in Cork’s art and culture scene is home to more than 2.000 works of art with an emphasis on the 19th and 20th Century’s Irish school. The gallery’s most prized exhibit is a display of Roman and Greek artifacts, brought to Cork in 1818 from the Vatican Museum in Rome. Entrance is free too! In Kinsale, County Cork. Built-in 1500 AD by the Earl of Desmond, Desmond Castle has served many functions throughout the ages including a prison in the 18th Century and as a workhouse during the Great Famine. By the early decades of the 20th Century, Desmond Castle had fallen into decay. Today, however, Desmond Castle hosts the International Museum of Wine Exhibition, one of the largest wine museums in Europe. A highlight for wine lovers. In Bantry, County Cork. Bantry House offers the visitor an impressive collection of tapestries, furniture and art treasures which were collected by the Earl of Bantry, who inherited the estate in the 18th Century. Built in 1730, the estate is truly magnificent, with gorgeous gardens that contain a wealth of sub-tropical plants and shrubs – reflecting the best in European design and style. The House and Gardens are open to the public and you can even stay on the estate, as they offer accommodation in the main house. There is a helipad, should you need to make a quick get-away!